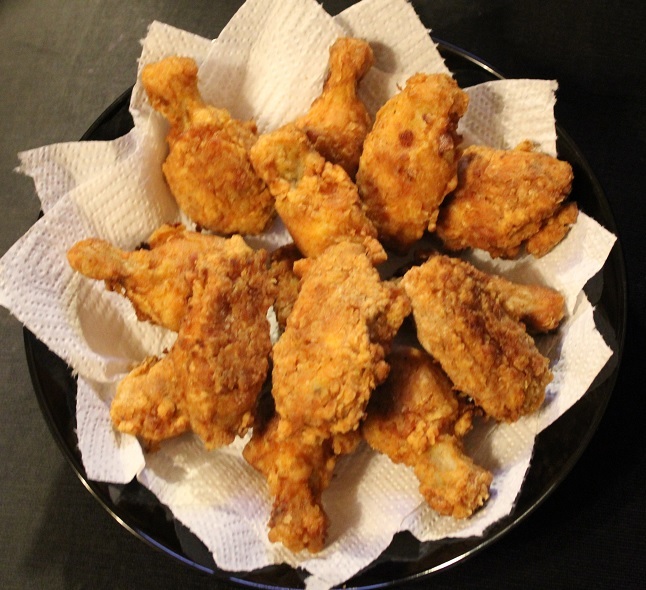 Based on my love for KFC hot wings I started experimenting with making my own at home about a year ago. What I enjoy most about KFC wings besides their perfect crispiness is that they are spicy but they’re not slimy or slippery like buffalo wings dripping in sauce. What I enjoy most about making my own wings at home is that they are incredibly inexpensive, which means that the process doesn’t exactly cut into my food budget and they’re always delicious so making up a batch of wings is generally a win win situation. The only thing that stops me from making them all the time is the thought that maybe I should give some consideration to my arteries once in a while. In 2013 I published a slightly different recipe but yesterday I tried adding another step. The new step does add about 20 minutes to the whole process but it also eliminates any possibility of under-cooked meat and makes the chicken extra juicy. 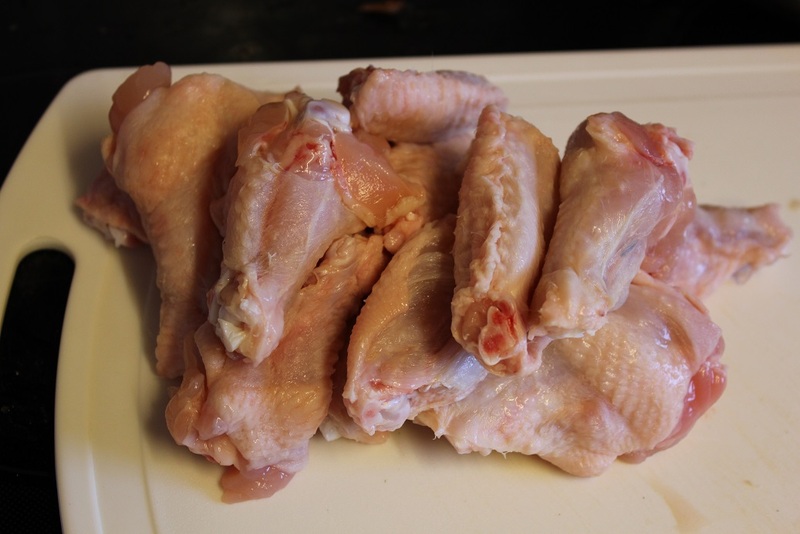 The first thing to do is to chop the wings at their joints. Discard the little meatless wing tip and just keep the other two pieces. Next put the wings in a pan and add about half of your sauce on top. 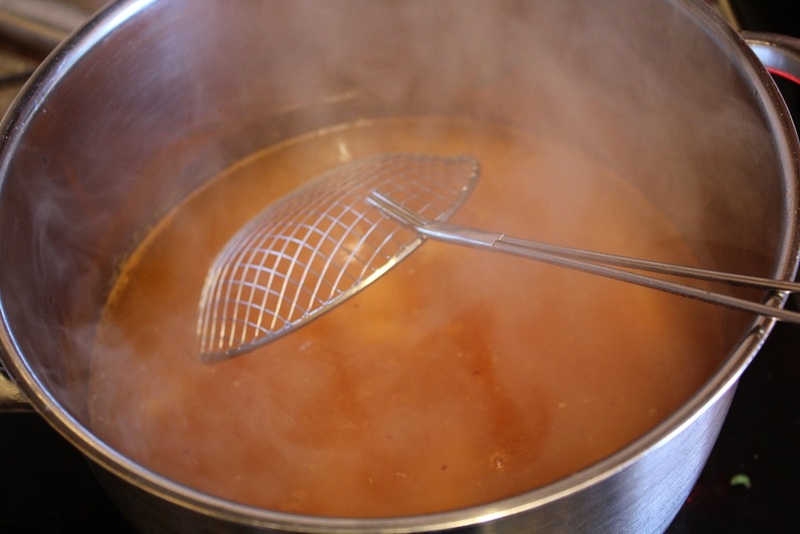 Then pour boiling water in so that it comes up about 1/2 an inch from the chicken and turn the burner on high. Poach the wings for 20 minutes but keep an eye on them to make sure that the water level doesn’t go down so far that anything starts to burn on the bottom of the pan. Once the wings have been poached you can remove them from the pot and place them all in a plastic bowl (one with a lid). 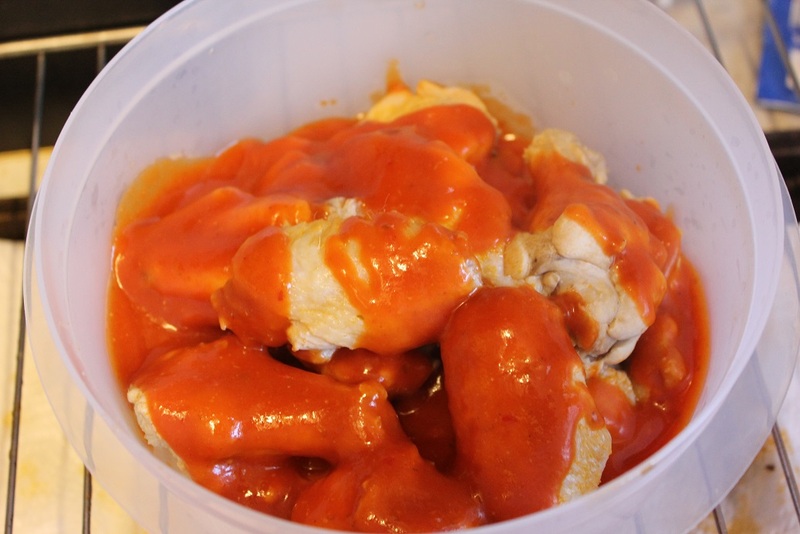 Pour the rest of the sauce on top and put the lid on the bowl to give it a good shake and place it in the fridge for 3-6 hours (or overnight) to let as much sauce settle into the chicken as possible. When you’re ready to fry up the wings remove them from the fridge and prepare yourself an assembly line. 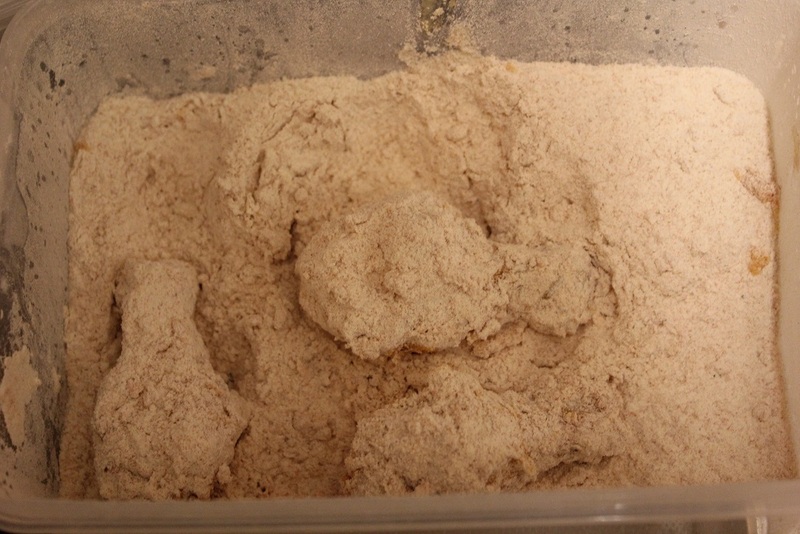 The first item of the assembly line will be a plastic container (with a lid) full of the flour and spices. You can also do it in a bag like shake and bake but it’s a lot messier. Combine the flour and spices then shake it up with the lid on to mix everything together. The next item of the assembly line will be a bowl with two beaten eggs inside. 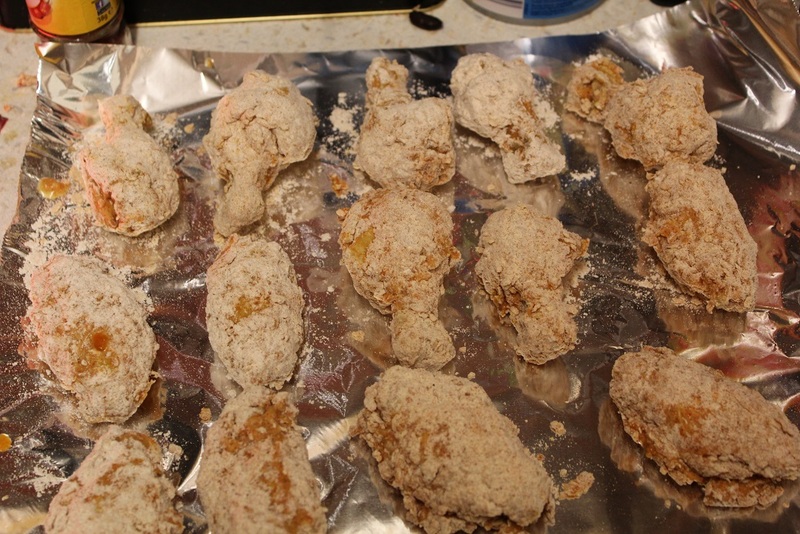 The third item of the assembly line will be a big sheet of aluminum foil on the counter top to act as a handy (disposable) place for the floured wings to live before they tossed in the oil. To coat the chicken just take the pieces out 3 or 4 at a time, allowing any excess sauce to drip off in the bowl before depositing them directly into the flour mix. Then put the lid on and shake until the wings are coated. Next dip the wings in the egg, allowing any extra egg goo to drop off and put them back in the flour for another shake. After the wings have had their second flour bath they can be placed on the foil sheet. Repeat until all of the wings are coated. You may notice that the longer the wings sit on the foil the more moisture will start to show through the flour. Don’t worry about it, they don’t need to look dry to turn out crispy. You have applied all of the flour that you need to already. To fry the wings just bring the cooking oil (about an inch) up to sizzle temp and keep the heat on medium high. 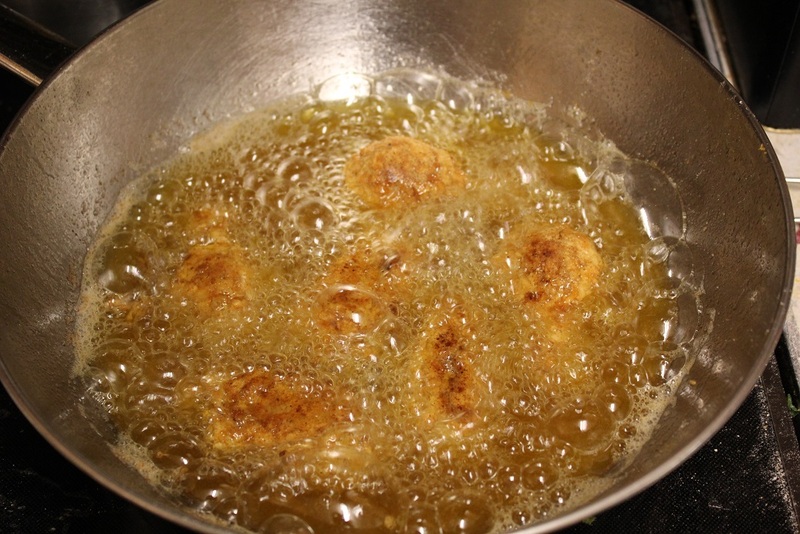 You’ll know the oil is ready when you can drop a little chunk of flour in and it sizzles away. 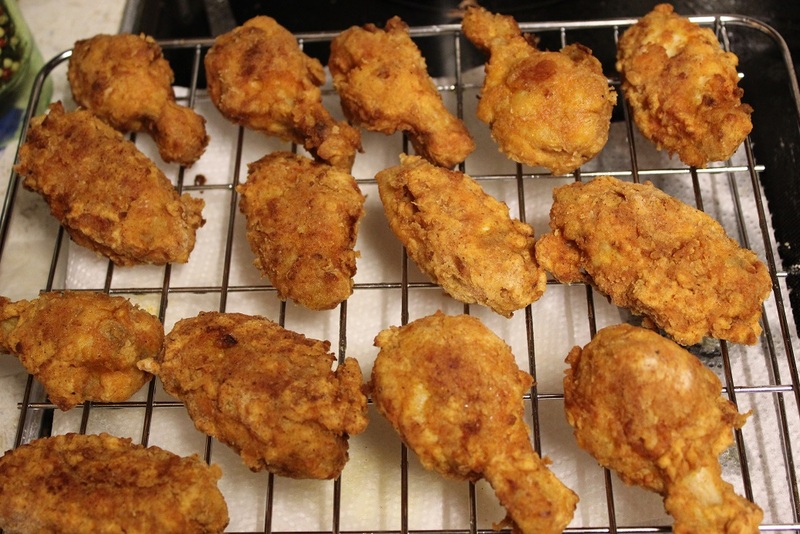 Since you already poached the chicken there is no reason to worry about making sure that it is cooked through which takes all of the guess work out of frying. Just cook both sides in the oil until they’re a nice golden color and put them on a baking rack to cool and dry. You can also pat the tops with paper towels to wick away any extra oil and then they’re ready to eat. Made today. One of the best things l’ve eaten and ever made. Thank you, Sue, Warwickshire, UK. I just made these last evening with wonderful results. My only comments, I had 24 individual pieces to batter and I ran out of the flour mixture with about 1/3 to go and I needed an additional egg. That’s not a bad thing, just a comment as I thought these were REALLY close to the KFC and was so very happy with the taste. Thank you! I made this chicken few days ago and it’s my favorite chicken recipe so far! I tried to make the flour cloth thin as much as possible and it turned out sooooo yummy! Thanks for sharing an awesome recipe! My son and I have just made this – fantastic! I only had an hour to marinade the wings but even still they were gorgeous! You need to make these! Boiling the wings first was a great idea. I used Franks Sriracha hot sauce with good results. 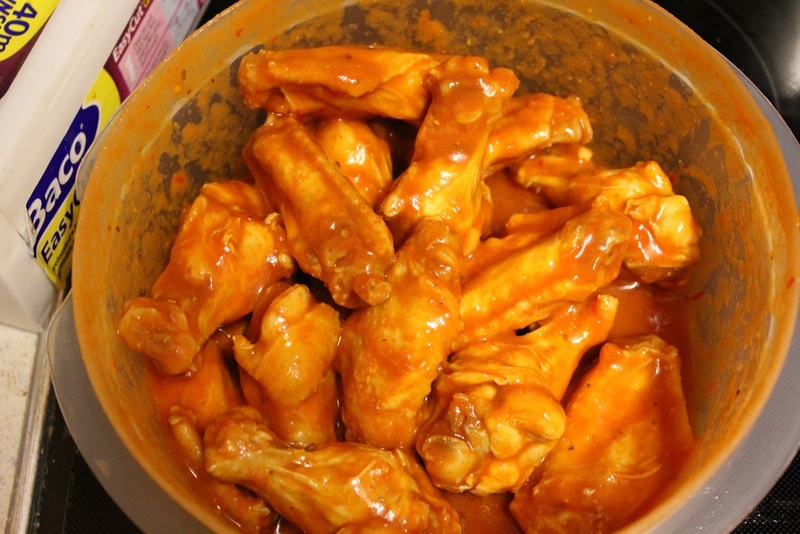 The remaining hot sauce on the wings after marinating made the wing have too much flour attached. I would suggest rinsing the wings before dredging in the flour & egg coating. Great Wings. How close is this to the actual KFC hot wings? It’s as close as I’ve been able to get it. The hot sauce under layer is key to turning up the heat… alternatively a dry rub might work well too. I’ll update the recipe as I try new things :) Hopefully more people will comment with their own feedback at some point too. FROM 1. (is nothing like KFC HOT WINGS) TO 10 (IS EXACTLY LIKE KFC HOT WINGS) how much point you give?